The Finnish manufacturer is holding two major events in New York and Helsinki on the same day; press invite shows off the Lumia logo prominently. 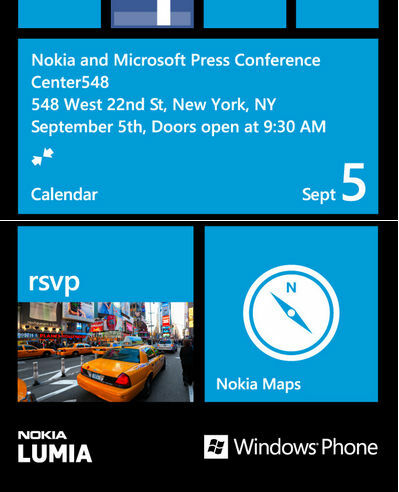 Nokia and Microsoft are holding a press event in New York on 5th September. With invites being sent to major American tech websites, the Finnish phone manufacturer is expected to announce its first Windows Phone 8 device. What else could a press invite containing different sizes of Live Tiles and Lumia branding hint at? Earlier this week, Nokia CEO Stephen Elop told Reuters that the company would soon announce a handset based on Microsoft's smartphone platform. Interestingly, Nokia World 2012 will also begin on 5th September in Helsinki. Therefore, it looks like the handset manufacturer might have plans to showcase the next Lumia at both these events. I bet Nokia fanboys will be hoping for a WP 8 handset with PureView technology. However, after looking at last week's leaked image, a Lumia with PureView seems highly unlikely to me.